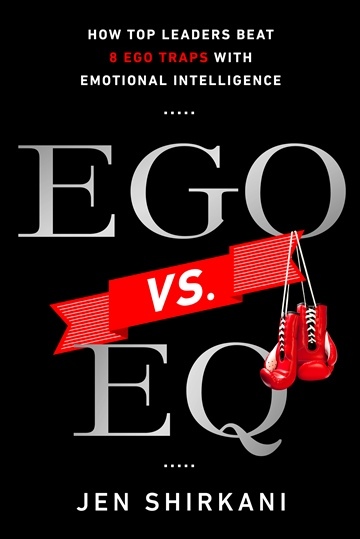 Jen Shirkani wrote Ego vs EQ to help leaders help themselves. Using her experience as an executive coach, she identified the common traps that set senior executives and business owners up for failure. From thinking technical skills trump leadership skills, to not letting go of control, to losing touch with the front line experience she watched first-hand how executives struggled with staying grounded in a feedback desert. She takes the science of EQ (emotional intelligence) and brings it to practical application for the senior executive or business owner who not only wants to survive, but thrive. Jen brings relevant and practical examples to life in her speaking events and is as comfortable speaking at large venues as she is with intimate groups for a corporate retreat. She provides insight into human dynamics in a humorous and engaging way. She presents the topic of emotional intelligence from a leadership perspective filled with practical strategies and immediately useable tips. Jen has worked with organizations from the Fortune 50 to family-owned companies helping leaders leverage the power of EQ. She was born and raised in Southern California and holds a Master’s Degree in Organizational Leadership.